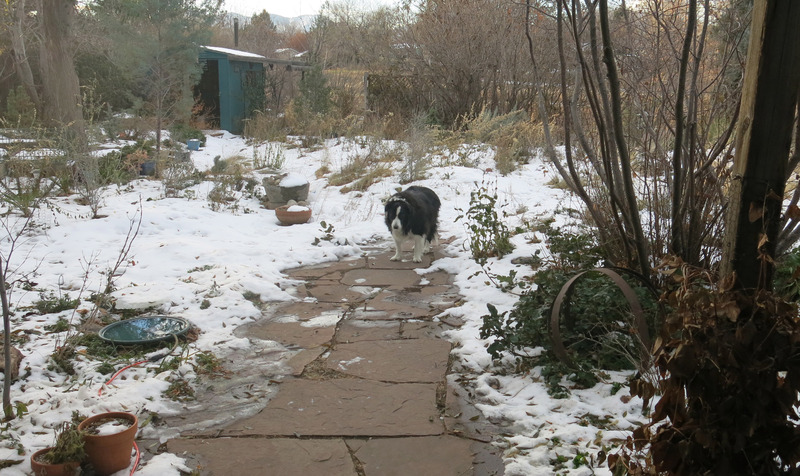 Greetings and salutations, everyone; yes, once again it is I, Chess the purebred border collie, filling in for the guy I live with, and here to bring you the latest and most fascinating news from our garden that I can. You may remember me from such fascinating posts as “Something From Nothing”, among so many, many others. Here I am in a characteristic pose. I’d just gotten scratched behind the ears, which always feels good. I’ve been feeling rather excellent lately, and the weather has changed to the point where I can lie out on the patio rug in the evening, taking everything in. 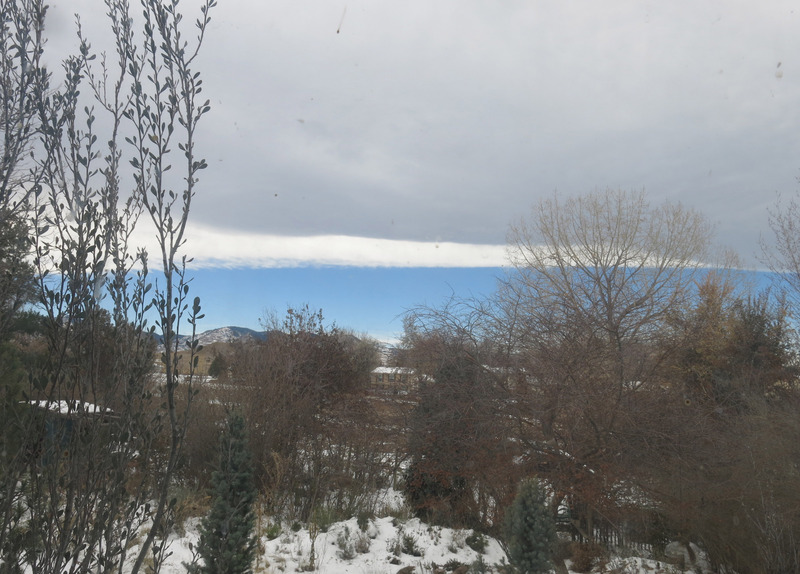 Yesterday there was a mountain wave. That’s a name for a cloud formation. It generally means that there’s a wind blowing, sometimes a chinook, and the wind was very pleasant. The snow is evaporating, and also melting, pretty quickly. There’s still snow on the ground, as you can see. The guy I live with, who is notorious for not following instructions, says that’s you’re not supposed to take pictures looking into the sun, but he does it anyway. Sort of looking into the sun, anyway. A little to the left, and look how interesting things get. We did a little walking around to see what suffered during our seventy-degree drop in temperature (in Celsius, say from +17C to -23C). The geraniums in pots, or pelargoniums in pots if you like, don’t look so good. The cypressus, Cupressus montana, looks fine. The guy I live with says this is from Baja California, which is way too weird for me. Maybe “looks fine for now” is a more reasonable thing to say. Winter hasn’t even started yet, really. Most of the plants in the new sand pile look fairly good. 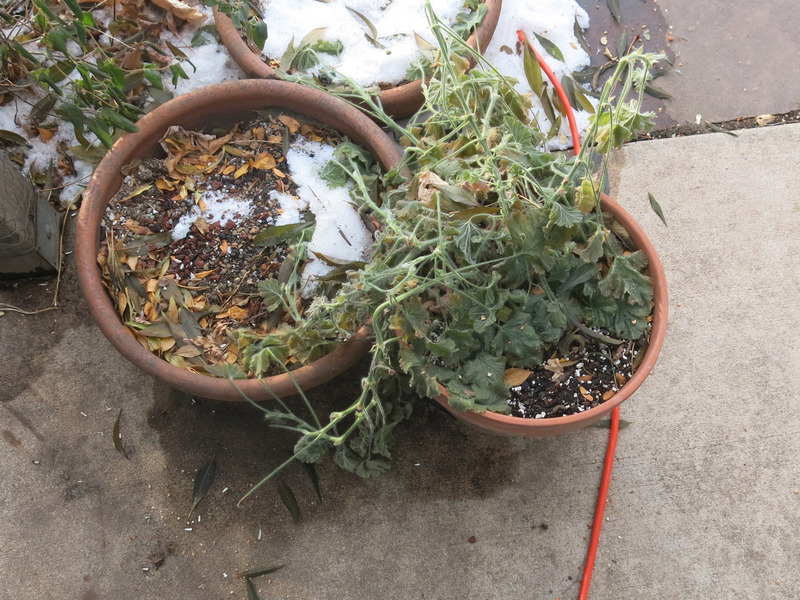 I know you’re not supposed to look at plants during the winter, or say anything about their survival until next June or so, but we say stuff, and look at things, too. We walked around the garden, and then that was done. Not everything is super happy, that’s for sure, but most things look okay. One thing that did happen today was the arrival, in the mail, of a lot of old seed. The guy I live with says some of it still might be viable, and so he’s going to sow it, and see what happens. 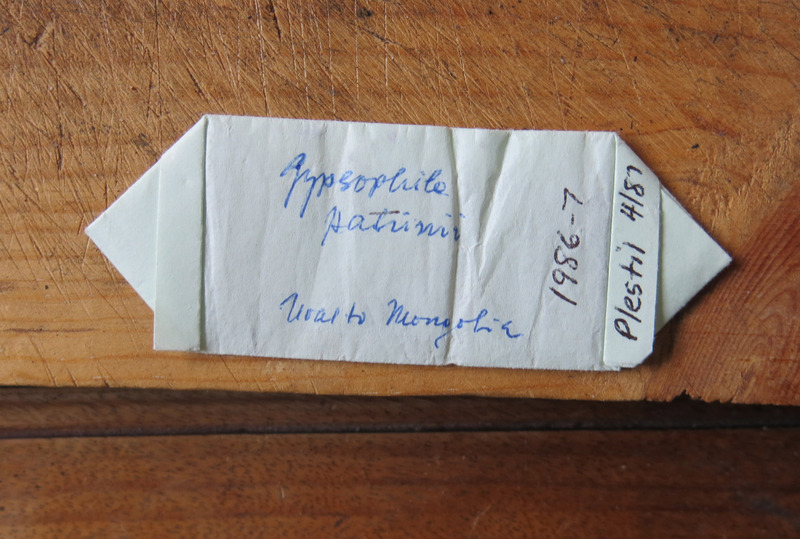 Gardeners who ordered seed from Czech collectors might recognize this little packet, made out of cigarette paper. He was somewhat moved when he saw this, reminiscent of happy days, now long past. It’s true that twenty-eight-year-old seed might not be viable, but a lot of species from harsh climates have seed that stays viable for a very long time. We’ll see, huh. So, I was going to say that that was our day, but then later on something fairly dramatic, not to mention scary, happened. 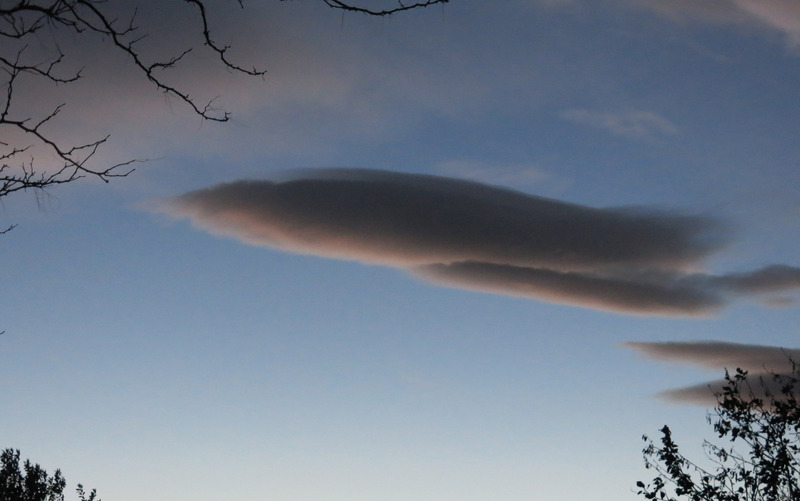 The guy I live with had taken a picture of a cloud he thought was interesting and came back inside to look at the picture on the computer, when he heard a sort of low whistling, like in The Adventure of the Speckled Band, but he knew what it was. 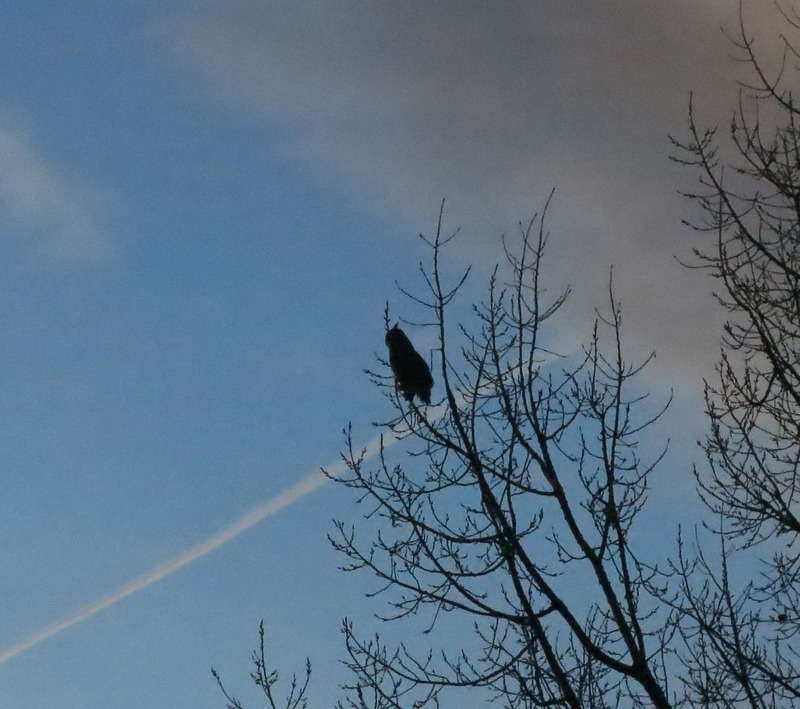 So the owls are back. 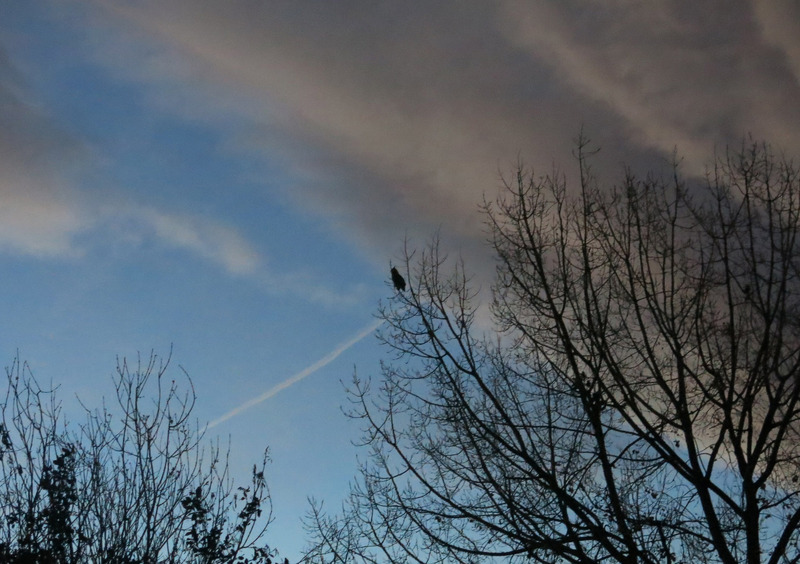 I say “owls” because there was a second one, off to the left (south), making the low hooting sound. I don’t know where they went. Now that really is it. Since I’ve lost a bunch of weight, I’ll try hard not to be carried off by an owl, which would make the guy I live with very sad, though he said that an owl “couldn’t possibly lift me”, which I guess is okay, though slightly rude. This entry was posted in Uncategorized and tagged Cupressus montana. Bookmark the permalink. Bonus day! Three Chess portraits – scritchy, garden and leisure – wonderful wave photos, and return of the owls. Plus, an illustrated turn about the garden to see how plants fared. 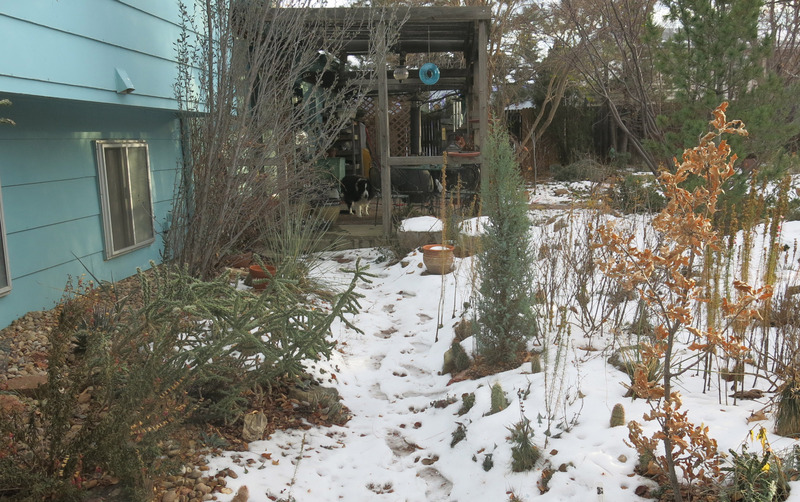 If that Baja cypress were mine, and in a pot, I’d bring it inside and hang a big red glass ball on it. Even in place, that cypress is crying out for a big red glass ball. 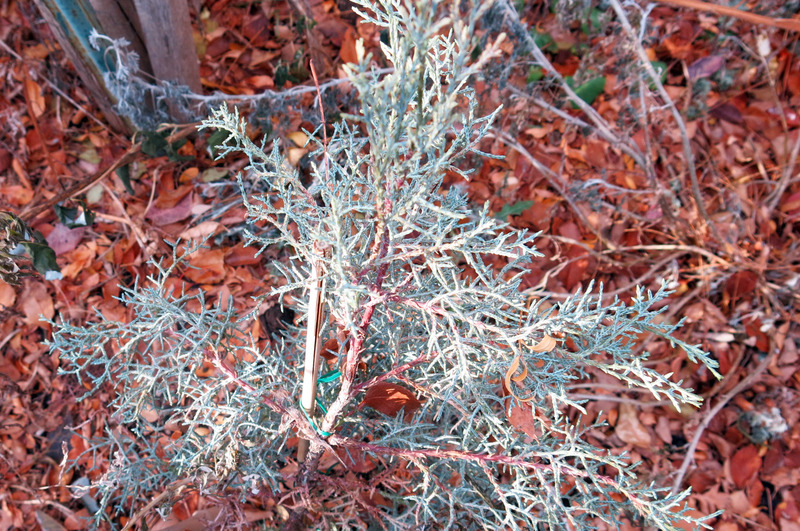 I have a California cypress – perhaps the same type since it also grows in Baja – holding down the corner of our property, so perhaps I’ll dart out there as soon as I locate a big red glass ball. Happy dreams, Chess. Thanks. Really four portraits of me, but for one you have to look closely, on the patio. Mountain waves are usually signs of chinooks here, which can weird people out like few other things. One day it’s a zillion below zero, and a few days later it’s so warm the guy I live with doesn’t need a coat (I always do), and sometimes, even at night. So like you go out on a moonlight night, and there’s snow on the ground, and the wind is warm. The Baja cypress, of which there are three here, is related to the Arizona one but comes from San Pedro Martir. Check it out here. http://www.conifers.org/cu/Cupressus_montana.php There are several big ones growing at Denver Botanic Gardens. The owls hunt in pairs and often wake up the guy I live with their loud hooting on cold winter nights, but they don’t wake me up. If they did, I’d just move under the covers a little bit more. The Adventure of the Speckled Band. You nee to give the guy you live with more credit, unless this reference was your idea. I took a photography class last year in Yosemite National Park. We were taught never to be afraid of shooting into the sun. Get a lens hood and go go for it. I’m the expert on scary stuff, like speckled bands and big scary owls. The guy I live with is in charge of reassuring me. The camera that was used in the latest post is a Canon Power Shot, so it doesn’t have a lens hood. I suppose one could be made out of a paper towel roll or something like that. 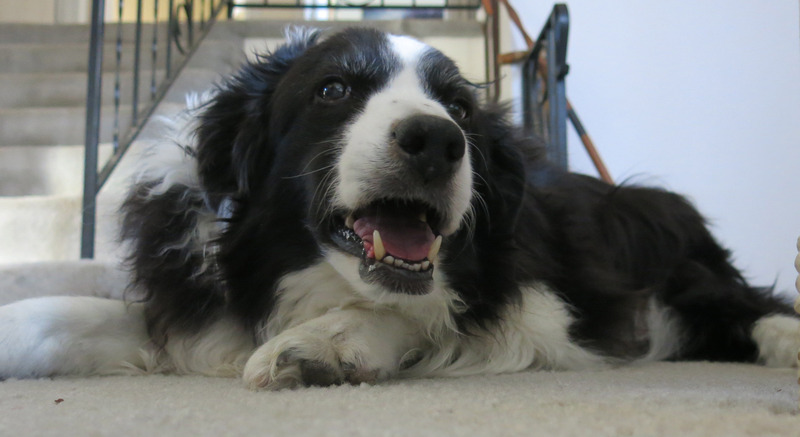 Speaking of which, the guy I live with used to cut paper towel rolls in half for me and my buddy Slipper; we liked to chew them up. I forget why, now. Two extra great pictures of Chess! 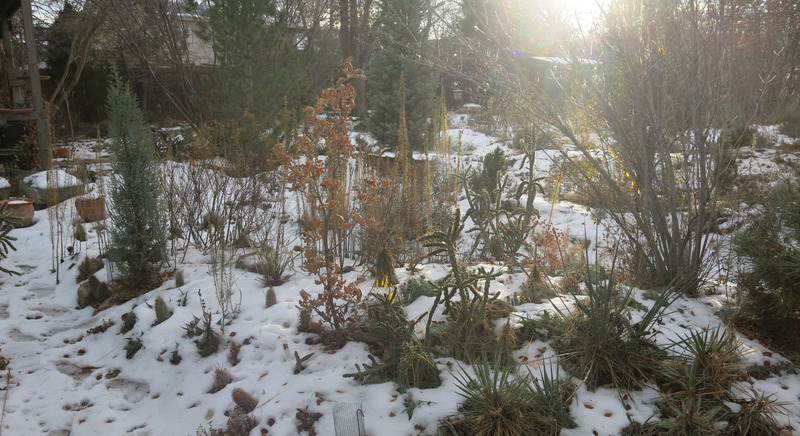 This made me laugh: “I know you’re not supposed to look at plants during the winter, or say anything about their survival until next June or so, but we say stuff, and look at things, too.” because I have been looking a lot at things, too, even though our temps did not get anything like as cold as yours. A couple of things were carried off, including two agaves the guy I live with didn’t want to bring back inside, because they were too heavy and too spiky. I know that sounds horribly cruel. It probably is. And the geraniums which he had all these plans for overwintering and then realized that there are already enough things screaming for attention. It did get really cold. In fact colder than anywhere else except the South Pole. That’s something to think about. Really and truly. The South Pole. It’s all warm and nice now so in a way it was like it never happened. There’s lot of dead stuff now, stems and things, which some people say to leave in place, but the guy I live with will cut everything back and then we’ll show a picture with everything cut back and looking neat. I look forward to that. Befores and afters! Well, just the after, since the before already happened. … Unfortunately, not enough work got done today because there was a nap that needed to be taken. (Like H. Allen Smith’s …not P. Allen, H….”Look at the haircut I need.” ) There was a nap there, and it needed to be taken. The guy I live with said that naps kind of get in the way of doing stuff, but whatever. It was another nice day today. So just think, in the last week or so we’ve gone from 60-something to minus 14 or whatever, and then almost back to 60 again. This is what people who talk about “wide temperature fluctuations” must mean, though I bet they never see them quite like that. The snowdrops that I posted pictures of are okay, by the way. Kind of amazing that anything survives something like this. (It’s not the first time this has happened.) 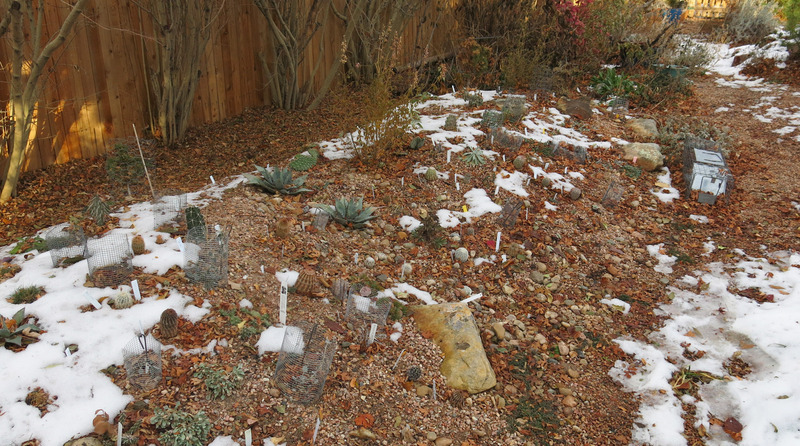 A lot of the snow has melted, too. It does help that it snows when it gets really cold.